Our degree audit system is available to students and their advisors via SeaNet. Degree Works is a web-based tool to help students and advisors monitor progress towards degree completion. Degree Works is live for all Fall 2016 students, going forward. The system looks at the degree requirements from the UNCW official catalogue, and any coursework completed and in-progress, to produce an easy-to-read degree audit. The degree audit is divided into block requirements of how courses count toward degree requirements. Check boxes exist within each block to easily outline what courses and requirements are complete or in-progress. Email Teresa White whitet@uncw.edu to set up the customized departmental training on Degree Works. The public trainings have been suspended. layout of this new system. 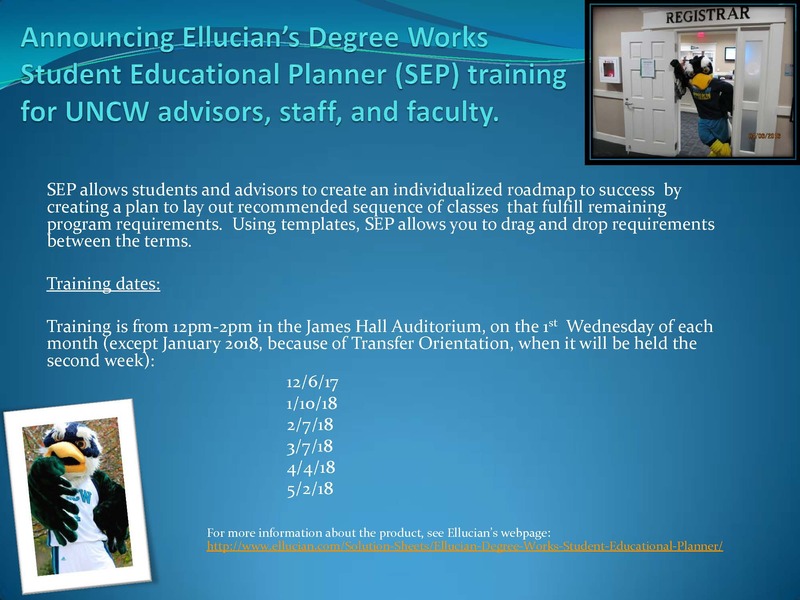 SEP allows students and advisors to create an individualized roadmap to success by creating a plan to lay out recommended sequence of classes that fulfill remaining program requirements. Using templates, SEP allows you to drag and drop requirements between the terms. Feel free to share THIS flier with those who may be interested in training.